R. Darvishi Kamachali, A. Abbondandolo, K. F. Sieburg, I. Steinbach. 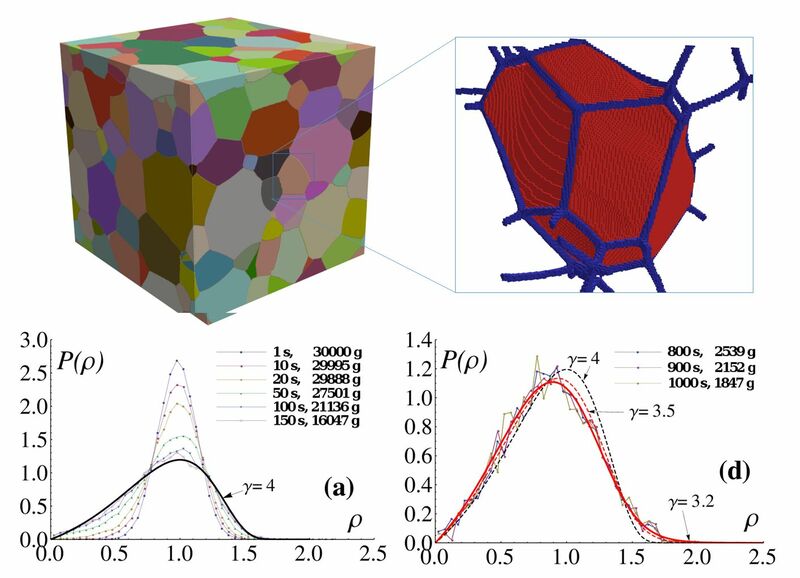 The mean field theory of grain growth has been revisited: We have shown the possibility of multiple self similar solutions for normal grain growth that only depend on the geometry of neighbouring grains. The figure compares simulation results with analytical solutions. The classical mean field approach for normal grain growth in polycrystalline materials is revisited. We re-drive and study possible self-similar solutions and show that the grain size distribution can be determined only by the geometry of neighbouring grains for any given configuration. In three dimensions, it is shown that a single index ⟨r⟩²⁄⟨r²⟩ can represent the geometrical characteristic of grains and has a one-to-one relationship with the mean field parameter γ. We reinvestigate the results of our recent phase-field study in the light of new analytical results and found a value γ≈3.5–3.2 for the stable regime.